Paul Stansfield was put through the wringer by his Knaresborough Town players as they played out a 10-goal thriller at Barton Town Old Boys on Saturday. 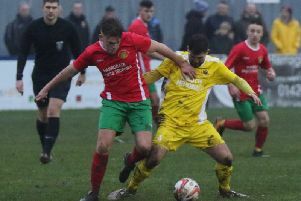 The Manse Lane outfit raced into a four-goal lead inside 32 minutes of their NCEL Premier Division clash, only to have seemingly thrown away three points when their hosts incredibly fought back to level matters late in the second period. Two more strikes at the death eventually saw Boro to victory, and although pleased with the result, Stansfield was left frustrated by aspects of his team's performance. “We had a 25-minute spell in the first half where we played the best football I’ve ever seen from this group of players," he said. “We were destroying them. Every time we went forward we looked like we would score and half-time came at the right time for Barton. "After the break they started lumping loads of balls into our box and we couldn’t cope with it. The momentum shifted and all of a sudden we couldn't get out of our half. “I was almost having a nervous breakdown at 4-4, but then we started playing again. The players took some responsibility, got on the ball and manged to do enough in the end. "They were told in no uncertain terms that the way we performed in the second half was not acceptable, however the positive is that although we had a meltdown we still had the character to come through it and get a result." 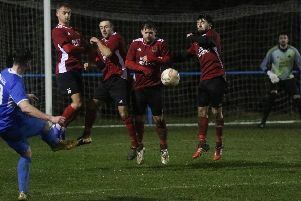 An early Rob Youhill shot was blocked and Will Lenehan fired over before Knaresborough moved ahead in the 11th minute. A Youhill cross from the right was helped on by Brad Walker and Josh Garbutt fired home. In the 19th minute, Walker sprinted clear on to Nick Black’s pass and doubled the away lead. Garbutt made it 3-0 on the half-hour-mark after another Walker pass, and then completed his second hat trick in the space of a week when he knocked home Dan Thirkell’s cross at the back post. Barton came out for the second period with far more purpose and Matthew Plummer scored in the 47th minute following a free-kick to reduce the arrears. Then, when Luke Aldrich headed in a right-wing centre moments later, the match was very much re-ignited as a contest. The Knaresborough nerves were frayed further after another right-wing free-kick led to Nick McNamara making the score 4-3 in the 61st minute, and with plenty of time left, the momentum was definitely with the home team. A period of relative calm followed, but eight minutes from time Gareth Barlow was afforded room to control and volley home an equaliser. At this point, Barton looked the most likely victors with Boro visibly shaken. Despite this, they managed to advance up the pitch where Garbutt earned his side a corner, delivered it himself and watched on as Barlow turned the ball into his own net. A sixth goal arrived in stoppage-time, putting a gloss on the scoreline as Garbutt found Walker, who had cleverly held his run inside his own half. The visitors' top-scorer then accelerated away from two defenders before beating home custodian Tom Collins with a powerful finish. Victory ensures that Boro remain third in the NCEL Premier Division standings, three points behind second-placed Penistone Church, but with a game in hand.